Many believe Nicki Minaj misuses a famous photo of Malcolm X with a rifle in his hands and juxtaposing it with a racial slur for her new song. Minaj posted the photo Wednesday on her website and Instagram page, and received criticism for how she used the Malcolm X image. It's for her new song "Lookin (Expletive) (Expletive)." The title uses the N-word. After she was roundly criticized on social media circles and beyond for what many saw as disrespect to a revered icon, she offered an apology Thursday on Instagram to the estate of Malcolm X — who was assassinated 49 years ago this month at age 39. She also said that the song's artwork "is in no way to undermine his efforts and legacy." "That was never the official artwork nor is this an official single. This is a conversation. Not a single," she wrote. "I apologize to the Malcolm X estate if the meaning of the photo was misconstrued. ... I have nothing but respect (and) adoration for u." Still, she sounded exasperated that people were even upset over the issue. "What seems to be the issue now? Do you have a problem with me referring to the people Malcolm X was ready to pull his gun out on as Lookin (expletive expletive)?" the 31-year-old asked in her post. "I am in the video shooting (the song) and there happened to be an iconic photo of Malcolm X ready to do the same thing for what he believed in!!!!" "Lookin" is a male-bashing song. 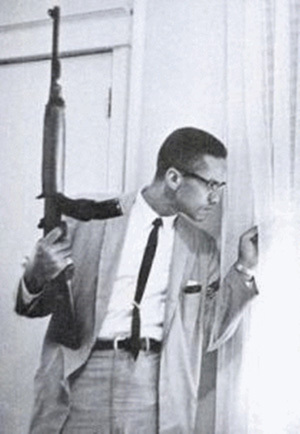 The photo of Malcolm X holding the rifle was taken when he was trying to protect his family from death threats (his home had been firebombed). Grammy-nominated Minaj said in a radio interview Thursday with Hot 97's Angie Martinez that she wrote the song to empower women because there are too many songs that attack women. "It was almost parallel in my opinion because he has this big gun ready to shoot at a lookin (expletive) bleep, and that's how I looked at it," she said. "I looked at it as this is one of the most memorable people in our history, in black history, who voiced his opinion no matter what, and I understand how my intent was overlooked and I definitely didn't want to offend his family or his legacy." She added that the song was made "to have fun," not "to be disrespectful." A Change.org petition posted online that encouraged the rapper to change the cover artwork had reached more than 1,500 supporters Thursday evening. Minaj's personal representative declined to comment and a rep for her record labels, Republic and Cash Money Records, didn't return emails seeking comment. A lawyer for Malcolm X's children also didn't immediately respond to an email from The Associated Press. The picture was deleted from Minaj's Instagram account, but was still on her website Thursday. "Lookin" will appear on Minaj's next album and a compilation album featuring Lil Wayne, Drake and others. AP entertainment editor Nekesa Mumbi Moody contributed to this report. True, she didn't think it through extremely well, but how she handled the criticism showed she had no intent to disrespect Malcom X.
I don't think Minaj intended to disrespect Malcolm X or his family. In my opinion this racial language Minaj chose to use does sort of contradict what Malcolm X worked towards. This word was a derogatory term used towards people of color back in the time of Malcolm X. Although the term is used differently now, it seems a bit contradictory to use with a picture of Malcolm X.
I do not believe she meant to be disrespectful. That picture was meant to empower African Americans when they were disrespected and that song is to do the same for females. I think she meant for it to represent the song in a different way. The term she used in the song frequently, is now used toward disrespectful guys not to be racist. Minaj made an artistic decision to use the photo on her album cover. I think people are desensitized to music. We listen to it in our cars, bedrooms, the shower, and it's literally everywhere. In my opinion we should take a step back and remember that music is a form of art and if it's fine for a painter to portray Malcolm X, it should be fine for Minaj to use his image as well.